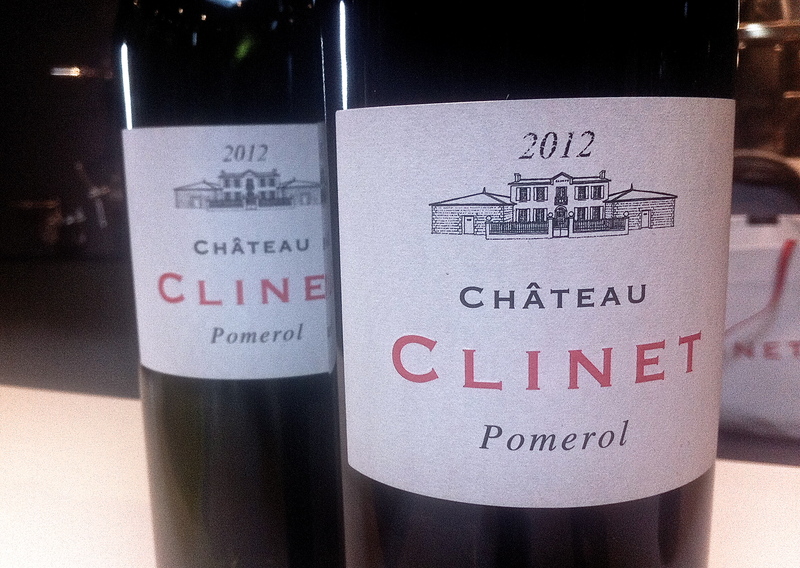 Château Clinet is extremely well known and located on the Pomerol plateau. It doesn’t come cheap – not that there is a bargain basement section in this pricey appellation – but you do get a wonderfully hedonistic and opulent wine for your money. The 2009 and 2010 are almost flashy but have lovely depth and structure. They are quite superb. Second wine here is Fleur de Clinet. Vineyard/Terrior: 8.64 hectares on deep clay planted with 85% Merlot, 5% Cabernet Franc and 10% Cabernet Sauvignon. Winemaking/Elevage: Aged for 18-22 months in barrel, 70% new and 30% one year old. 2013 Deep and thick; dark at centre; little dumb at first; depth clearly but lacks expression; some sweetness and density; obvious material and sap here and palate not too dry; still needs to settle. Has depth but lacks expression. [90% Merlot, 9% Cabernet Sauvignon, 1% Cabernet Franc]. Drink 2018-2026. Tasted UGCB April 2, 2014. 88-90. 2012 Mid depth; glossy looking; satiny quality to the aromatics with layers; real delicacy on the palate; nicely polished; good length. Little reticent for Clinet. Nicely composed. Drink 2017-2027. 91+ UGC Oct ’14 [Earlier note] Deep and dark; colour tight to the rim; tight but clearly very deep on the nose; serious, not its usual flattering self; layers here which show themselves on aeration but this is a pretty dense Clinet. Lots of depth on the palate and structure too. Pretty formidable effort. Excellent length. 90% Merlot, 9% Cabernet Sauvignon, 1% Cabernet Franc. 93-95+ UGC 10 April, 2013. 2009 Deep and arterial; really saturated; inky and saturated aromas, less overt than shortly after bottling but clearly full; plush palate, rich and seductive; fleshy and very fresh. Lots of extract and grip with more chew than before, clearly this filling out. It feels bigger and more structured than before. Pretty dramatic effort but the fruit is dazzling and not at all plodding. Needs time now. 2017-2030. 95+ MW Institute Nov ’13. [Earlier note] Black and saturated in the glass; more lift and delicacy; lots of complexity on the nose; black fruits but some lift; very overt and showy; mocha and espresso notes too; creamy, ripe and full palate; wonderful density; such ripeness and material; real saturation but not chewy; quite delicious; far too much of a good thing! 97+/100 UGC 2011 [Earlier] Mid depth; deep; very perfumed and attractive nose; plums, spice and lovely oak; red fruits too; seductive; Palate round and generous; big and bold but tannin extraction well done here. This is excellent. Some coffee on the finish. [Later] Very ripe nose; almost like the Petit Village; attractive; sweet, fragrant and seductive; excellent; red fruits, plums; very sublime palate, pretty spicy. Tannins nicely done. Wonderfully seductive wine. 95+/100 [85% Merlot, 5% Cabernet Franc and 10% Cabernet Sauvignon – 14% degrees]. Tasted 31st March 2010. 2007 Deep and saturated look; blackcurrant and cassis; fresh and uncluttered; depth too; blackcurrants and cassis on the palate too with some chocolate but not tired or seemingly overworked; fresh. Chewy on the finish. Good effort. 91+/100 MW Institute Nov ’11 [Earlier] Mid red; less purple than the Gazin; soft, attractive nose, some sweetness; nicely perfumed; perfumed palate with medium weight; lacks a bit of depth and chew but quite fine. 88+/100 UGC Oct ’09. 2006 Real density in the glass; quite saturated and up to the edge; legs; polished nose with savour and life, some fig and tar but intense and not loose; real precision here and also minerals and wet stone notes too; not as flamboyant as 2009 or 2008 even but pent up and layered; palate quite lush, lots of fruit, some extraction and intensity but doesn’t feel too forced. Bit of a sleeper which needs a few more years. Some grip and bite at the end. Excellent 93+/100 MW Institute Nov ’10.